Hilton made an announcement back in April last year (2014) (access here) that they would be moving away from yearly award category changes and would adjust award categories “seasonally” that seems to roughly every other month/every three months based on the observations. Hilton HHonors has just updated its web page where they post these changes. These changes were announced per their website today September 30, 2015. You can access Hilton’s web page for these changes here. You have to bear in mind that Hilton’s award categories don’t mean as much as they used to because the number of points within an award category varies a lot and can be changed unannounced. Hilton HHonors Unannounced Hotel Category Changes & Stealth Devaluation In Making? There are 33 hotels moving up in award categories and 11 moving down of which two in Panama by two award categories from 4 to 2. If you are planning to book any of the hotels that are moving up in award category, you should do it before the October 14 . For award bookings for hotels that are moving down, you should do them once the new award pricing is in effect. If you already have a reservation for one of them, just contact Hilton HHonors after the change and they should be able to reprice the award. 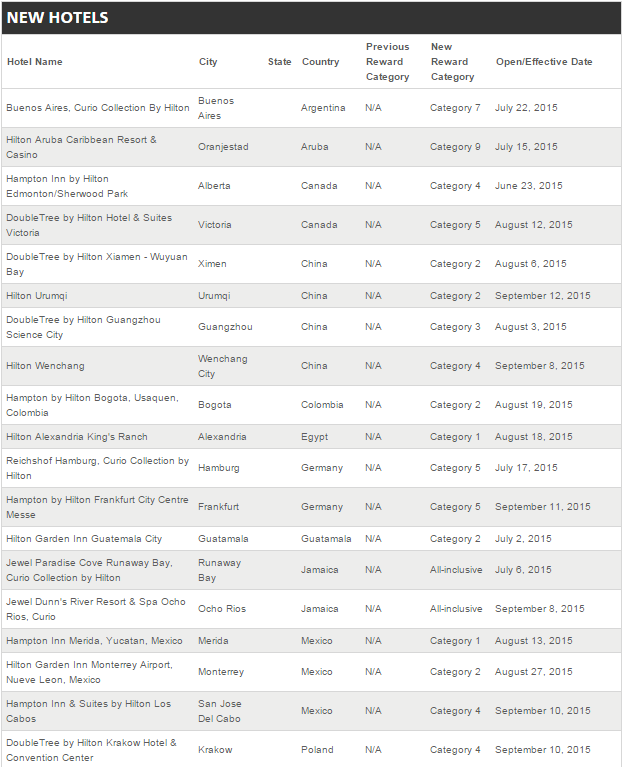 There are total of 93 new hotels that have been opened since the last update in July. Previous articleWould You Bump Nobel Laureate? United Did!